Want to Know the "Minim" of Life? "Dates" don't always work to accommodate the Upper School's challenging, final exam schedule, and so the school took advantage of the last school day before exams to treat the freshmen students to a taste of the trees of Eden, to mark the "New Year of the Trees," Tu B' Shevat. The students were given a special opportunity to work and learn together with extraordinary environmental educators: Mr. Elan Margulies from Hazon, as well as Mr. Yoni Stadlin and Ms. Chelsea Taxman from Eden Village Camp. Hazon is an organization that works to create healthier and more sustainable communities in the Jewish world and beyond. Mr. Stadlin is the founder of Eden Village Camp, a Jewish environmental overnight camp where campers are immersed in an environmentally sustainable, socially just, and spiritually connected world. Ms. Taxman is the farm director at Eden Village, and she believes in the beauty of every living thing. Their passion for our God-given bounty was palpable and the students responded to their authentic and unpretentious manner. Mr. Stadlin's session fascinated the students as he recounted the several months he spent living aloft in ancient redwood trees that were slated to be cut as an environmental protection initiative. Today, those trees are alive and well. He linked his daring act to the Tanakh by citing sources that command us to protect the Earth, especially our fruit-bearing trees. In Ms. Taxman's session, the students learned about medicinal properties of trees and about a fruit-bearing tree that grows in New York (Hawthorn). Students were encouraged to share their own brachot and wishes for wellness for both trees as well as family members. Students later made their own Heart Tonic by mixing maple syrup water, hawthorn berries, leaves and rose petals. Several students daringly tried a few drops, smacked their lips, and enjoyed the excitement of tasting a healing herb. Mr. Margulies introduced a new way to appreciate tea and demonstrated tea leaves that have medicinal properties. 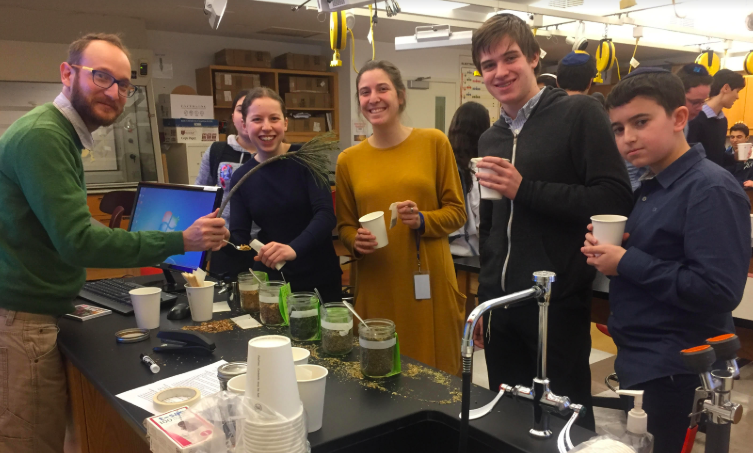 The students carefully followed his instructions and made their own tea bags, choosing from a host of natural herbs, and drinking a good hot cup of homemade tea, on the spot! All of the Hebrew classes watched a shortened version of the new and exciting film recently released by Jerusalem U, "Fruit for Thought." The film addresses another theme related to Tu B' Shevat: the importance of water and Israel's role in introducing innovative methods to sustain its natural water sources to its neighbors in the region, and to countries as far away as Malawi. The "Greener Israel Story," is a must watch!